O my Master, O Master! My Beloved Master, my Lord! Look how I'm all consumed in this divine love affair! The school of divine love is unique indeed! He who has learnt it's lessons, has no leave of absence. Wherever I'm, there the whole universe is me! Tell me only this, where is my place? Only in my heart is Your abode. O Intoxicating Beloved! my Friend! - Original lyrics from Haji Bedam Warsi Ali Shah (1882-1956), a new rendition is done by Queen of Sufi Qawwali, Abida Parveen @ Coke Studio by the title, Ramooz-e-Ishq. [>] You may listen, watch and download both audio and video from CokeStudio site. Abida Parveen is well-known for her Sufi works and at Coke Studio she brings some never-before heard combination of Sufi kaafis and dohas. Unlike the rest of her repertoire, ‘Ramooz-e-Ishq’ is in Urdu (also popularly titled 'Mein Hun Mashhoor'), and dwells on the love man has for his Creator. The piece has beencomposed in such a way so that the emphasis remains on the Sufi message. So even as the entire Eastern-Western house band plays music – violin, bass, drums, keyboard et al – the sounds being produced are very subtle during her renditions. The focus is entirely on the singing and giving Parveen space to express herself. 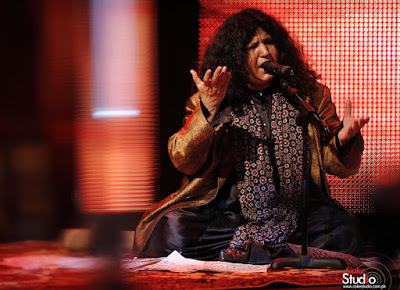 Abida Parveen is a very advanced seeker herself and what she sings, she sings from her heart. Asal joh hei woh asal se juda hua hai, magar yeh hei ki usko doondhna hei, ki asal cheez hei kya. Talash to ussi ki hei sabhko, jahan sachai mil jaye bass usko chodna nahi chahie. Logon ko mast karna hei, ki sufi mausiqi se dargahi mausiqi se. Duniyavi cheezon se alag karna hei. Mausiqi eek hawa ka safar hei, bass meri tou lagan yehi hei, aur tou meri kohi duniya hei hi nahi. Eek mohabbat hi hei joh eek chamatkar taufa hei, yeh na dheko ki kaun hei, yeh dheko ki kya keh raha hei. "Faqat nigah se hota hei faisla dil ka, na ho nigah mein shauqi tou dilbari hi kya hei"
The Reality is connected to the Real but one has to search for it and find out what is Reality. Everyone is seeking That (Reality / The One) only; and when one finds Truth one should not leave it / just hold on to it. Make people ecstatic through Sufi Mausiqi (Sufi Music), Dargahi Mausiqi (Holy Music). Take them away from worldly engrossment/ from materialism only. Mausiqi (Music) is the journey of divine breath, that is my only devotion, I have no other world than this. It is only Love which is a magical gift. Dont look for the identity or face or form, pay attention to what is conveyed. The heart is judged by the glance of the Beloved (nigah-e-rahmat / glance, gaze of loving compassion), If however, the eye does not carry passion/ yearning/longing then what remains the meaning of that Ishq / Love? If Beloved is not showering His glance of love upon us that means we don't have passion, thirst and longing worthy enough to love Him. Among the Sufi Music that Abida Parveen sings, many of them are from Haji Bedam Warsi Ali Shah (1882-1956), may Allah bless his soul. Bedam Warsi is one of the most popular sufi lyricist whose songs are sung at sufi shrines and in households symbolizing devotion and love for God. In his spiritual life, Bedam Warsi was a great dervish poet & Murid of Haji Waris Sarkar.